A review of a book that is seeking to, Replace Darwinism. This book does not drift into debates on the Flood or the Age of the Earth, instead it focuses on the fascinating world of atoms. A sequel to the first book by this author, it has a title that invokes images of a sweeping change in the wind for mainstream science. It follows on the heels of the first book “So Who Is This God Of Our Nations and What Does He Do For You?” which started the proposal. It called on individuals to help support a shift in not just biological sciences, but in educational systems as well. 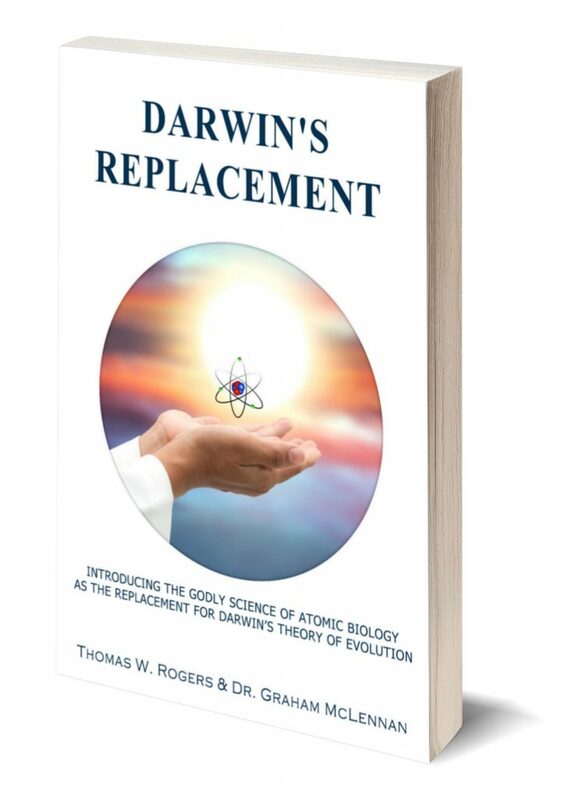 “Darwin’s Replacement” by Tom Rogers of Reality Research and Development Inc. in BC Canada is an attempt to make some waves in an already disturbed sea. The upset stones being tossed into these waters seem to have a logical basis that could potentially help to increase the growing waves in this field of research and theory. Darwin’s Replacement further explores the implications of observable biology at the atomic level. It is given the fitting name Atomic Biology and examines the head-spinning speed of "guided and coded processes" that occur during the construction and transport of biological microscopic entities billions, trillions, and even quadrillions of times daily. If you think of Ford’s assembly line introduction in the early 20th Century and how it changed the way consumer items are mass-produced, you will have a very crude idea. What happens daily at the molecular level is stunningly far more complex and efficient. Not to mention occurring at light speed. Tom focuses his attention here to make a point that some will undoubtedly shrug away as a gap-filler, but others will see as arguments joining a growing chorus of arguments. The goal here is to put an unsteady crack in the foundation of the Neo-Darwinian strongholds on biology. The title implies that Darwinian and Neo-Darwinian principles need to be abandoned as they are no longer accurate or helpful. Indeed this is the assertion of the book which favors a “follow the evidence wherever it leads” methodology and suggests that evolution, as understood and taught in mainstream science has become more of a dogma than an observed, factual science. In its place, the author presents a logical argument from something can be observed today, right now! Not by trying to extrapolate from past events that are hidden behind the veil of time. This Atomic level analysis of Biology has only been made available for observation in recent scientific history. Technology has enhanced our view of the molecular world and what we find is stunning, to say the least. Recent forays into nanotechnology seek to mimic some of the already present natural nanotechnologies that are occurring at a cellular level right beneath our noses. Atomic Biology theory takes the next logical step using the evidence and postulates that there are intelligent processes, laws, and designed mechanisms at play. They make things work at lightning speed at the atomic level. These processes are reported to have defined, and crucial accuracy with start and end points, fail-safes, and “engineered” steps that cannot be explained by chemical interactions or blind chance. For those that like to live outside the box a little, Darwin's Replacement would be a good read. It is bound to get a discussion going in your own mind and perhaps ignite some heated conversations with friends and family.